Ikariam is a free to play strategy based MMO where players must earn resources, build up structures to improve their town, train up a huge army and try to expand their borders outside of their own island. Ikariam can be played directly through the games official website and accessed in your web browser without the need of a client download. Ikariam is a city building MMO where players must focus on acquiring resources and managing them to advance through the game and expand their territory borders to form a sprawling empire. 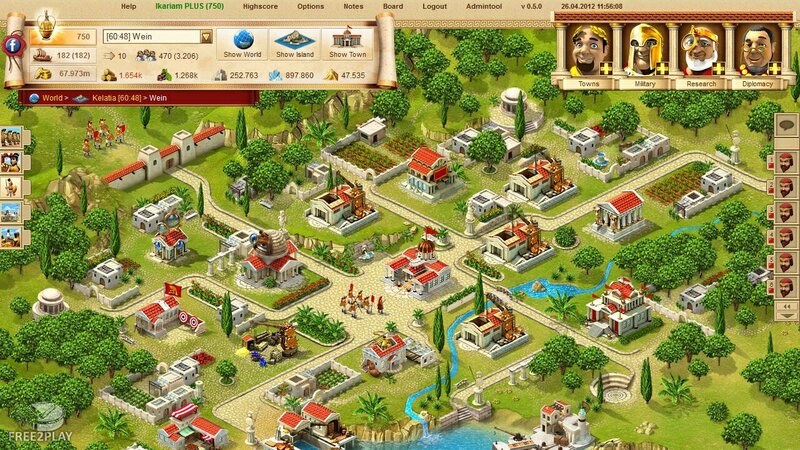 Players are able to build up their city, train huge army to attack rival players and defend their territory. The game primarily focuses on PVP conflict with players creating alliances, trading with each other or going to war over resources and territory. That are five main resources within the game that players will need to acquire in order to be successful in improving their city. The primary resource that is needed for practically every build that a player will need to create is Wood, from constructing and upgrading buildings, creating ships and training up units. 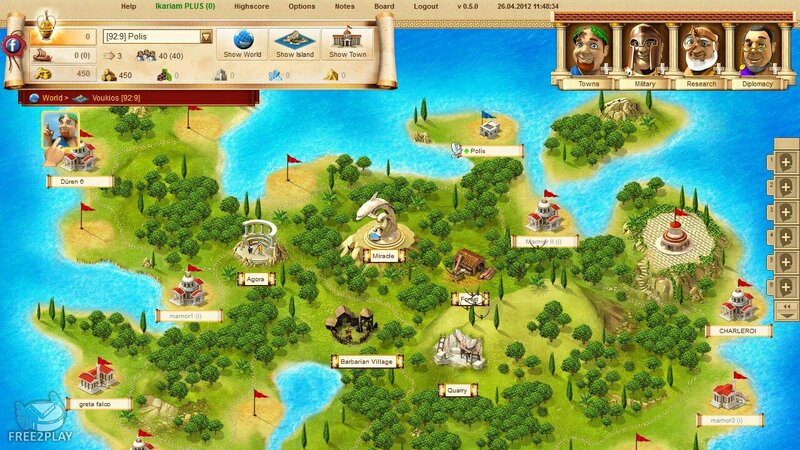 However, there are also four Luxury resources that players will need for specific buildings and units (Crystal Glass, Sulphur, Wine and Marble), unfortunately each island only has access to one of these resources and so players must either trade them with neighbouring islands or potentially band together to take over their neighbours and claim the resources for themselves. Barracks - In this building players can train soldiers equipped with swords, spears and other weaponry and taught how to fight, as well as construct war weapons. Players can upgrade the barracks to train units at a quicker rate, and to gain access to new troops. Academy - This place of knowledge and learning allows players to research new technologies; when upgraded players can employ more scientists to research technologies faster. Players are able to build an army either to try to conquer their neighbours or to defend their own territory from other players. Land units can be sent to other towns, either the players or one of their allies but typically they will be used to try and Pillage a rival town to steal their resources. Players are able to target and individually attack specific town's an island, even utilising Spy units to bring information on a town before an attack begins, where the player is attacking units will go up against the intended targets defensive units as well as their structural defences e.g. city walls this. 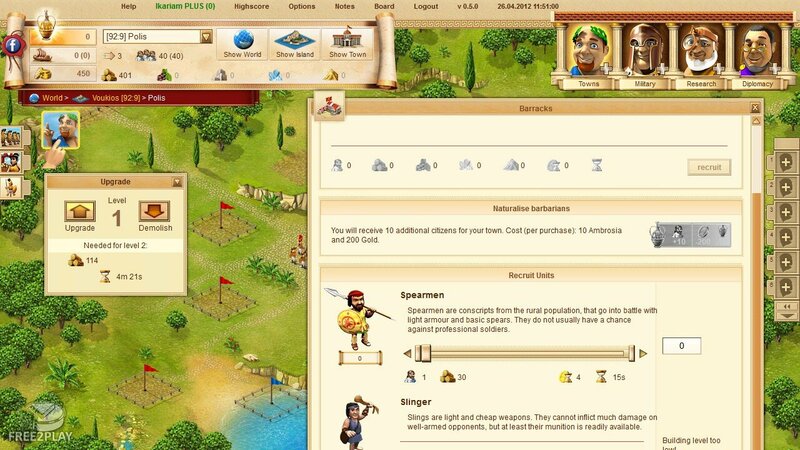 If a player is successful in their attacks they are able to Pillage their targets resources and add them to their own supplies.